This textbook offers people around the globe a new and unique approach to design and realize Enterprise Architecture and Integral Solutions much more visually and effective at strategic level. Dragon1 is well suited for anyone interested in working with architecture, both as members of projects or participants in planning the architecture of the enterprise. The book serves as a textbook for MBA and Informatics students. Students of Dragon1 can tackle complex issues by creating SMART architecture visualizations. These, in turn, create a common understanding among stakeholders leading to realistic strategic decisions by CxOs and management. Dragon1 Textbook (1st edition) prepares architecture professionals for the 'Dragon1 Foundation' examination. The big question is - how can enterprise architects and managers use Enterprise Architecture at a strategic level to effectively control the risks inherent in enterprise transformation? This study guide addresses this question in a structured way using the Dragon1 Open EA Method. Dragon1 has rediscovered and adopted the power of architecture visualizations and design books to provide decision support to owner/clients analogous to the methods used in the field of building architecture. This study guide highlights the added value of Enterprise Architecture using this metaphor. Dragon1 is built on the premise that Enterprise Architecture is all about visual design and realization of all architecture domains (i.e. business architecture, information architecture, technical architecture and solution architectures). Architects design total concepts for various enterprise domains and solutions aligned with the enterprise’s strategic vision to deliver value-add support in business transformations and IT innovations. This study guide is structured to show the ‘Ways’ and the 'Dragon1 Open Standards' of the method, followed by practical examples using Dragon1. The 'Way of Thinking' and the 'Way of Representing' are discussed in great detail to explain the process-oriented and product-oriented approach of Dragon1. The chapter on the 'Way of Representing' is of particular importance because it describes how visualization of architecture governance design and realization is a key success factor to Enterprise Architecture and Integral Solutions. This study guide plays an important role to inspire everyone who is involved in working with architecture to apply this new Enterprise Architecture methodology much more effectively at a strategic level. Dragon1 is both an EA Tool and an open EA Method. This textbook about the open EA Method is very useful creating visualizations in an EA Tool, especially when using the Dragon1 EA Tool. 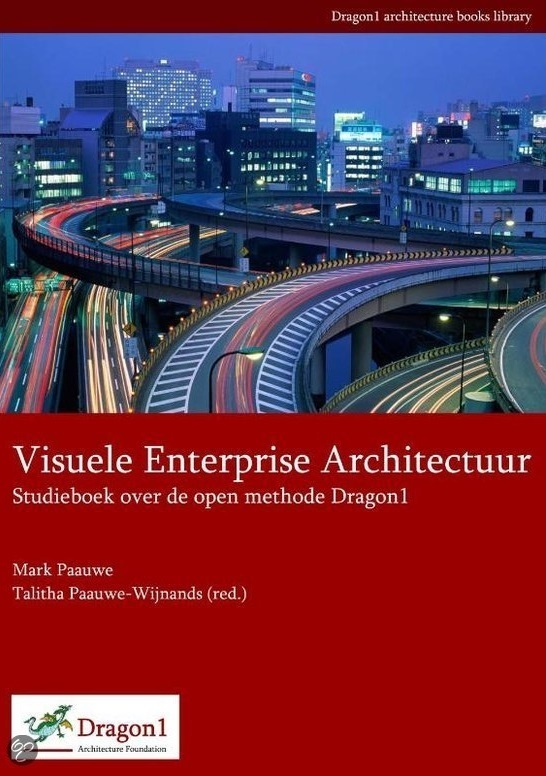 Order a paperback or full color copy of the Dutch version of Visuele Enterprise Architectuur here at Bol.com.